The text of the decision of McCulloch vs. Maryland. McCulloch vs. Maryland was another landmark case in John Marshall's career. This time, it would grant Congress, instead of the Supreme Court, greater power. The case involved James McCulloch, a cashier at the Baltimore branch of the Bank of the United States, who refused to pay tax to the state of Maryland for the bank. Based upon this, Marshall ruled that Congress had implied powers not granted in the Constitution and that it could create laws as need to perform is duties. So, Congress was fully within its rights to create the bank. 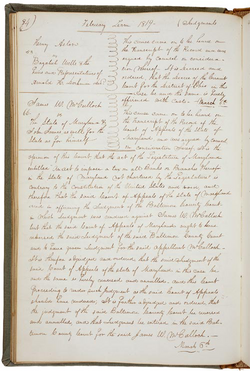 In addition, Marshall declared Maryland's attempt to tax the Bank of the United States unconstitutional because it interfered with the federal government. This established the principal that federal power was greater than state power in the case of conflict. The two new principals established in this case, that Congress had implied powers and that federal power was greater than state power would both eventually play an important roles in future legislation. These two new principals would also add to John Marshall's legacy and his influence on our world today.